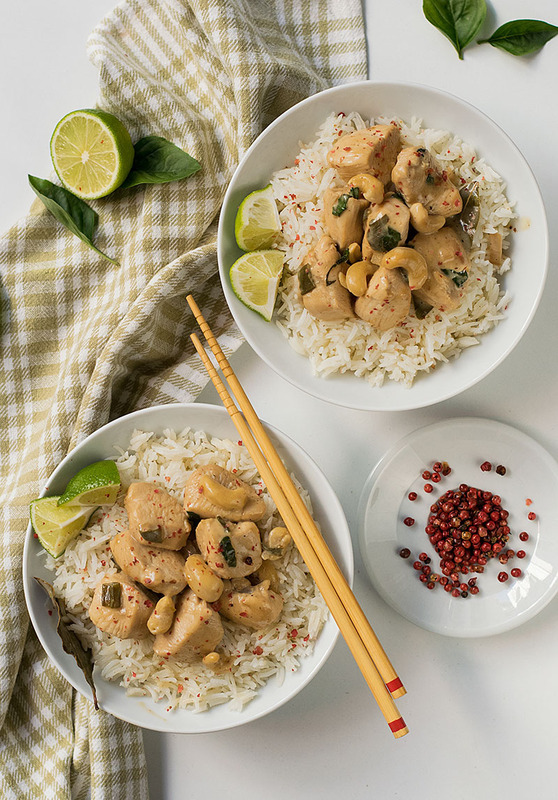 A very easy 30-minute Thai chicken recipe with all the bright flavors we love! OK, the thing is, I’ve never been to Thailand. So, even if I’ve eaten in quite a few Thai restaurants, I believe I haven’t tasted true Thailand food. I believe that in order to get the true taste of any ethnic cuisine, you should visit the country and eat food made from local ingredients, and prepared by local people. Hence the title Thai style chicken and not Thai chicken! Having that said, this dish is one of the most delicious dishes I’ve ever tried! 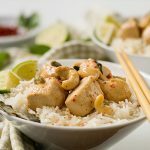 It features all the classic flavors such as lime, basil, coconut, ginger,and scallions and some more I felt the need to add to make it super flavorful, bright and irresistible! 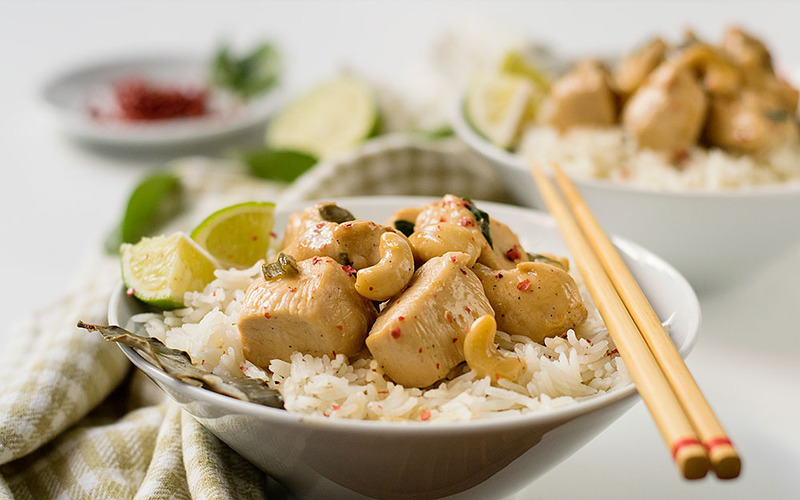 In addition, this recipe is cooked in less than 30 minutes and is very easy to make, since it’s prepared in one pan and requires minimum clean up… Oh, and it’s also gluten free! A bit of corn flour is used to make the sauce more thick and creamy, but you can skip this if you like your sauce on the thinner side. I never buy coconut milk. I always buy coconut cream and if in need for coconut milk I just mix 1/2 cup cream with 1/2 cup water to get 1 cup of coconut milk. It’s also cheaper this way! 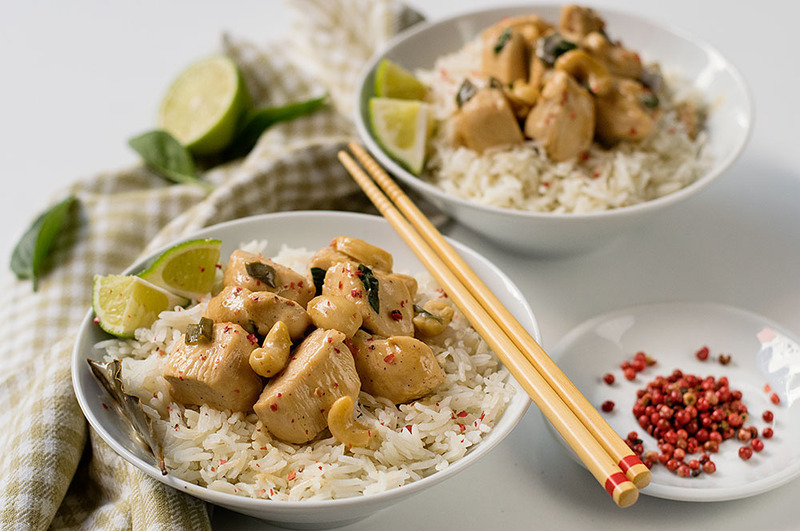 Serve with some fluffy rice, preferably Jasmine or basmati. 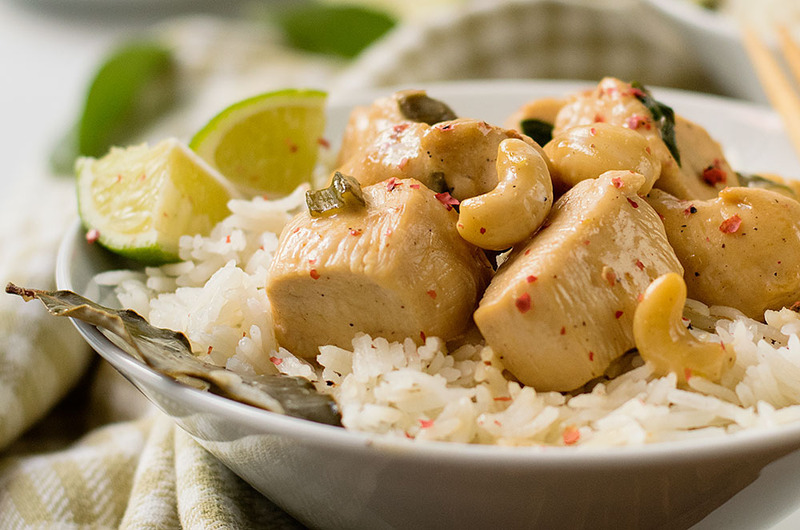 A very easy and quick recipe with all the Thai flavors we love! It’s made in one pan and is naturally gluten free! Heat a big skillet and add the oil and the chicken cubes. Let the chicken cubes brown from one side on high heat, about 6-7 minutes. Turn them to cook from the other side about 5-6 minutes more, transfer in a bowl and keep warm. In the same skillet, add the onion, bay leaves, scallions, cashews and a little extra oil if necessary. Reduce to medium high heat and cook until the onion is translucent, about 5 minutes. In the meantime, in a jug or bowl, mix the cold water and corn flour until dissolved (this step is optional. You should do this if you want the cream on thick side). Add the coconut cream, lime juice and zest, ginger, basil, soya, sugar, anise, cardamom, salt and pepper. Stir to combine. Add the chicken back to the skillet, add the coconut cream mixture and cook stirring constantly for 5-10 minutes until thickened. Quick, simple, and most importantly delicious. This is right up my alley! Love finding new treasures like this!! Thank you very much Karly!!! Yum Yum.. 🙂 Thai Food are always comforting. This looks perfect for an easy dinner night. Pinned !! !